The Smokin' Goat - Zuercher & Co.
Grupo Ganaderos de Fuerteventura is a family run dairy whose mission is to protect cheesemaking traditions in the Canary Islands. 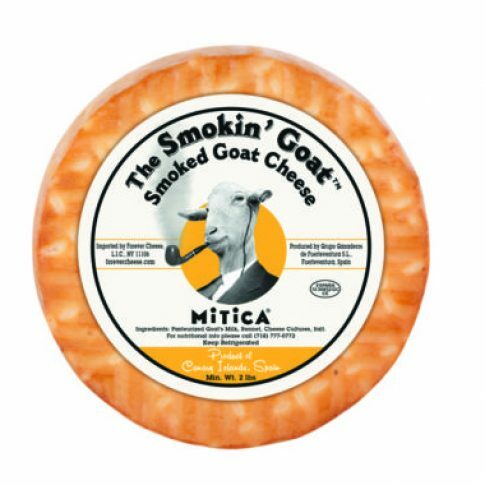 Smokin’ Goat is made with local Majorero goat milk, which is naturally high in fat and protein, making for a smooth paste. The cheese is lightly smoked over beechwood, adding toasted notes to an otherwise sweet and tangy goat cheese. The rind pattern is a nod to the palm leaves historically used as cheese molds.